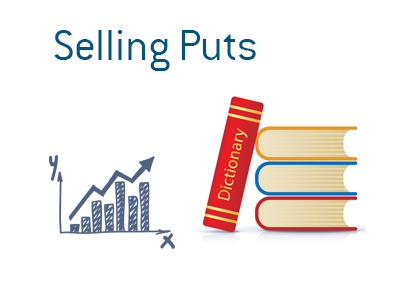 Selling Puts - What Does It Mean? Do you know what Warren Buffett and Mark Cuban have in common, aside from being unbelievably rich? Both men are proponents of selling puts (in the right circumstances), and both men have used the selling of puts to their advantage and profit. Many people recoil at the thought of selling options premium - isn't that the fastest way to go broke? Isn't the investing and trading landscape littered with the carcasses of people who thought they would be smart and sell options premium? Like practically anything else in life, too much of anything is a bad thing. Selling options premium can either be unbelievably smart or recklessly stupid - it is all situationally dependent. There absolutely nothing wrong with selling puts, as long as you know what you are doing. In fact, selling puts is an EXTREMELY smart way to generate income and potentially lower your entry point on a position. Let's look at an example to illustrate the concept of selling puts. Let's say that you want to buy Apple. Shares of Apple, however, are currently trading at $115, and you have decided that you are going to wait for another pullback and buy it at $100 even. As a matter of fact, you have a standing order in place with your online broker - as soon as Apple hits $100, you will buy. This is all well and good, but wouldn't you like to get PAID for waiting until Apple hits $100? This is where the concept of selling puts comes in. Now, when you buy a put, you are buying the right to SELL 100 shares of something at a certain price. So, if you buy a $100 put on Apple, you have the option to sell 100 shares of Apple at $100 at or before the expiration date. Once the option expires, your premium is gone. People who might buy a put include those who are hedging a long position or those speculating that Apple is about to drop in price. Now, what about the person who is SELLING this option? After all, if somebody is buying the put, somebody else must be writing it. By selling this $100 Apple put, you are saying that you are willing to purchase 100 shares of Apple at $100. The shares will get "put" to you if Apple falls below $100. Now, let's say that there is 23 days until expiration on this put. This put, in addition to a number of other factors that make up the price, has time value. With each passing day, the time value (or theta) will decay. By selling the put, you can take advantage of this time decay. The buyer of the put will pay you a premium, and if the option ends up expiring worthless, you will collect all of the premium. So, let's say that Apple is trading at $115 and there is currently four weeks left until expiration in the put that you are looking to sell. This put is currently trading for about $1.25. You decide to sell a single put for $1.25. Since 1 options contract represents 100 shares, you actually collect a premium of $125. 1) Apple will fall under $100 and you will be "put" 100 shares of Apple at $100 (assuming that you don't close out your position beforehand, of course). 2) Apple will stay above $100 and you will collect $125 in premium. Now, by selling puts, you are lowering your cost basis for Apple. Let's say that you end up getting "put" 100 shares of Apple at $100. Well, you have already pocketed $125 in premium, so you have effectively lowered your entry point to $98.75. Slick, right? Note: there is absolutely nothing that says you can't close out your position early. For instance, if your put has lost half of its value, you can exit your position for a 50% gain instead of holding it right until expiration. Warren Buffett has famously sold puts multiple times over the course of his career. In the late '80s, Buffett wanted to buy more shares of Coca-Cola but wanted to purchase at a lower price than what it was currently trading at ($39 at the time). So, Buffett elected to sell $7.5 million worth of puts at $35. By selling puts, Buffett lowered his entry point in the worst case scenario. If the puts expired worthless, Berkshire Hathaway would keep $7.5 million in options premium. Let's say that the puts were trading at $1 when Buffett sold them. If Berkshire Hathaway was "put" the shares at $35, this would mean that their effective entry point would be $34 per share ($35 - $1 in premium). So, instead of Berkshire Hathaway just placing an order to buy at $35 and waiting for shares of Coca-Cola to drop to that point, they essentially acted as the "house" and were paid until Coca-Cola reached their desired entry point. Increased volatility will increase the price of options. So, many traders will look to times of increased volatility (such as, increased turbulence in the markets) in order to sell puts with inflated premiums. Mark Cuban, for instance, did this in the summer of 2011 when markets were roiled by the United States having their credit downgraded.